Whenever I want to explain Pasteles en Hoja (Roots and Beef Pockets) to somebody who has never seen them I usually say “they are a little bit like tamales, with different ingredients and wrapped in plantain leaves instead of corn husks”. I know it’s a roundabout way of explaining it, but it gets the message across. If the person knows what a tamal is to start with. So what are Pasteles en Hoja? 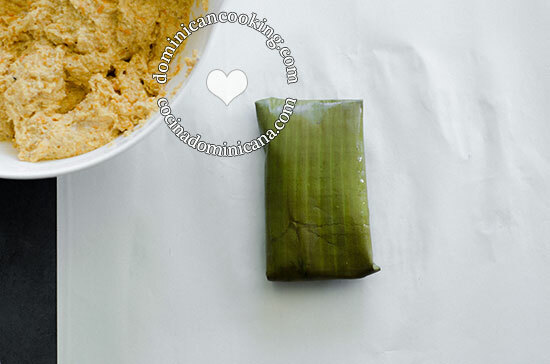 Pasteles en Hoja are a tamal-like food, popular in the Dominican Republic and Puerto Rico. Instead of a corn “masa”, a plantain (or unripe bananas) and roots batter is used as the base. They may be stuffed with beef (most common stuffing), chicken, or whatever strikes your fancy. It’s made with many ingredients that, although common in the Dominican Republic, might be hard to come across in your own country, so plan this recipe ahead to give yourself time to hunt down all the necessary ingredients – it will be worth it. If you find it impossible to get the banana tree leaves, don’t despair; you can use parchment paper as a substitute. There is also a yuca (cassava) version that I love every bit as much. 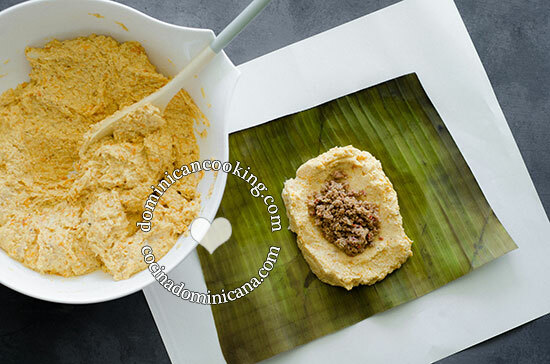 Pasteles en Hoja (Plantain and Beef Pockets) are an essential part of Dominicans Christmas and New Year's Eve dinner. Recipe with step by step photos makes your life so much easier. Mix the beef, cubanela pepper, onion, oregano, pepper and salt. In a shallow pan heat of oil over medium heat. Add the beef and brown, cook for 10 minutes adding water by the tablespoons as it becomes necessary. Add tomato sauce. Mix well and simmer over low heat for 5 minutes. Simmer over medium heat, adding a tablespoon water when it becomes necessary. Let all the liquid evaporate. Remove from the heat and reserve. Peel and grate the plantain, taro, pumpkin and yam. 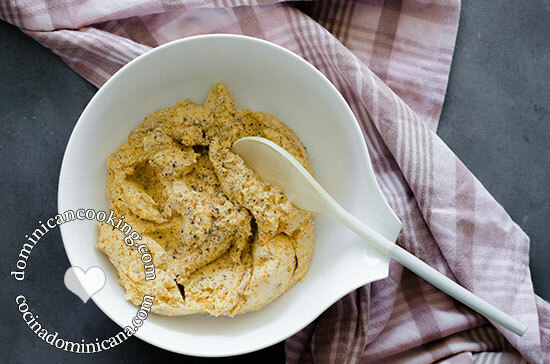 In a deep bowl mix the plantain, taro, pumpkin, yam, milk, seasoning powder and salt. Cut the plantain leaves into 6 - 5"x5" [13 x 13 cm] squares. Put 3 tablespoons of the plantain and root mixture on the center of one of these squares. Put 2 tablespoon of filling in the center, cover with 3 more tablespoons of the root mixture to cover the filling. Fold the leaf square in the shape of an envelope. 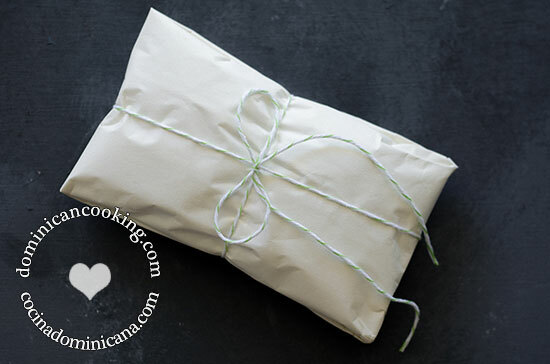 Wrap again in parchment paper and tie tightly. When all are done, bring half a gallon of water to boil in a deep pot. When the water is boiling, add 1 tablespoon of salt. Put all the pockets in the boiling water and boil over medium heat for 30 minutes. Serve garnished with hot sauce and ketchup. For wrapping I prefer to use both plantain leaves and parchment paper, it is more waterproof that way and the plantain leaves retain a nicer color. If you cannot find plantain leaves, then use parchment paper only. Please be aware that "yam" does not refer to sweet potatoes, but to a different vegetable. Do you have a vegan recipe for the pasteles? I need one. What could i put instead of meat. You can try with your favorite vegan filling. We sure do: arroz con leche. Love it, made it and I was awesome! I loved to hear about your adaptations, and I am glad it worked. Im feeling resourceful and im gonna give the “patele” a try for Christmas. The only time I saw the process of making the pasteles I saw oil or butter added to the paste (masa). Will it have the same consistency without? 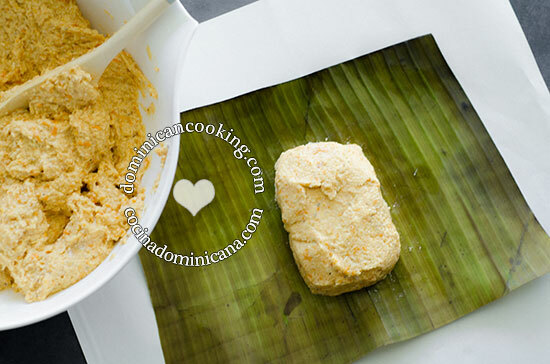 There are more or less 9.5 million different recipes for pasteles en hoja (one for each Dominican). Of course, each person will swear by his/her version. This is where you can get creative and start doing different things. I love mine, but I have tried many other wonderful versions, so it’s hard to go wrong on this.